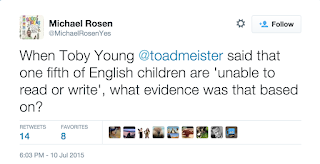 A concerned teacher has brought to my attention the latest example of less than totally honest behaviour from the loathsome Toby Young, who has taken to spraying around misleading statistics as a way of deflecting criticism of his beloved Tory politicians. As Michael “Oiky” Gove has now been removed from the Education brief, to the relief of many decent educators who wished it had happened rather earlier, he is now defending the PM. A parent had written an exasperated letter to Young Dave following her daughter’s SATS results, telling how a year 6 pupil had been told that she was merely “average” and that this was somehow “not good enough”. The Tories do love to go on about pupils allegedly “coasting”, forever imputing lack of achievement somewhere along the line - and usually dumping on teachers, who get similarly smeared. 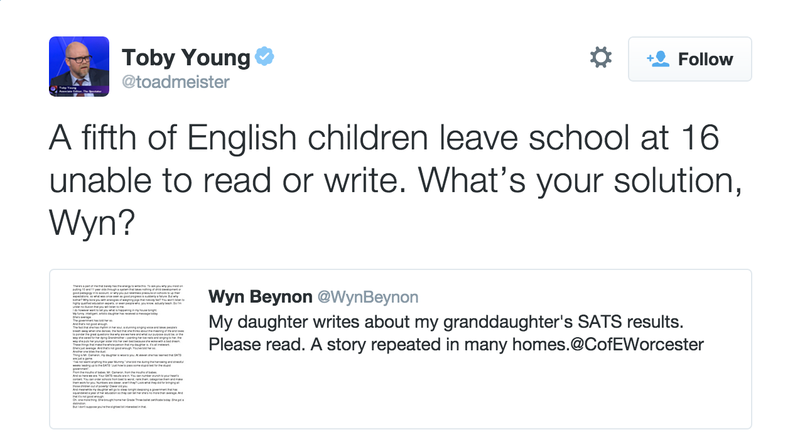 Wyn Beynon, whose daughter wrote the letter, Tweeted on the subject. Tobes was, as so often, immediately judgmental: “A fifth of English children leave school at 16 unable to read or write. 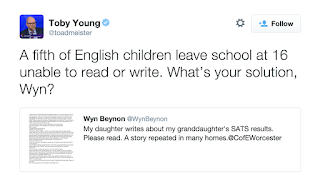 What’s your solution, Wyn?”. Given that the literacy level in the UK is in the high nineties per cent, something looks odd about the figure Tobes is pitching. There is a good reason for that - and it’s that he is wrong. Let’s take this nice and steadily: 80% or more of pupils leave primary education with level 4 SATS, while 93% attain level 3, which is the expected standard for basic literacy. Tobes is implying that rather a lot of those somehow regress during their secondary education, but according to the Government’s own criteria, they do not. Consider English GCSE results in (for example) 2011 (see the figures HERE). These showed that over 98% of children attained between A* and G, where G equals level 1 (basic literacy). As there is some difference between Tobes’ 80% and 98%, one has to ask where he is getting his figures. The answer may lie in a TES article from 2010, which tells “Government-funded research claims 20% of 16- to 19-year-olds lack basic skills”, going on to claim that they are “functionally illiterate and functionally innumerate”. However, and here we encounter a significantly sized however, this is not the same thing as being unable to read and write. Indeed, the Sheffield report cited by TES says of mathematical ability “very basic competence in maths, mainly limited to arithmetical computations and some ability to comprehend and use other forms of mathematical information”. That emphatically does not mean innumerate. Moreover, Local Schools Network has cautioned against misinterpreting the Sheffield study - which is exactly what Toby Young appears to have done in his efforts to disparage a critic of the Government which he so slavishly supports. Meanwhile, he should apologise for telling Wyn Beynon a porkie, but won’t. After all, being a good Conservative nowadays means never having to say you’re sorry. There are lies, damn lies, statistics, and then there’s Toby Young. No change there, then. 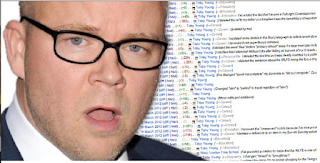 [UPDATE 1930 hours: Tobes has helpfully admitted that his "a fifth" figure did indeed come from the Sheffield study cited in the TES article, which shows he is talking, not for the first time, out of the back of his neck. 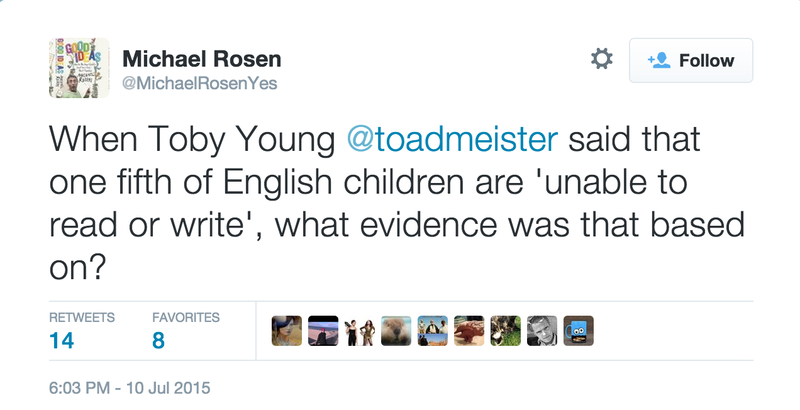 Michael Rosen asked "When Toby Young @toadmeister said that one fifth of English children are 'unable to read or write', what evidence was that based on?" 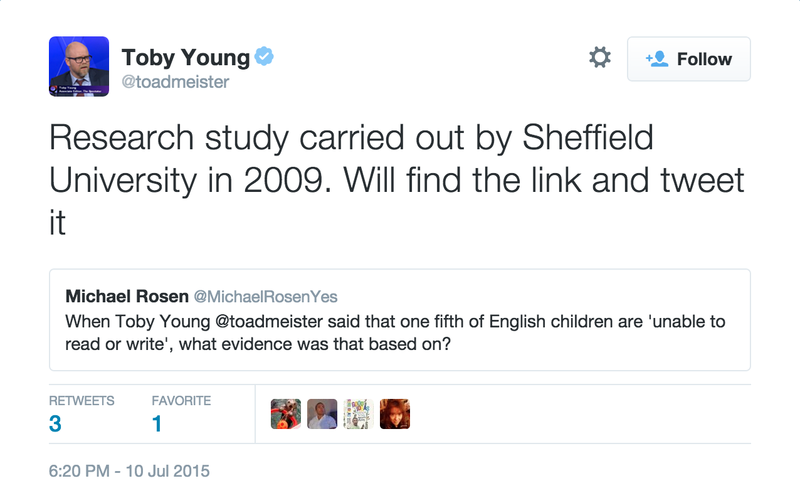 Tobes helpfully replied "Research study carried out by Sheffield University in 2009. Will find the link and tweet it". 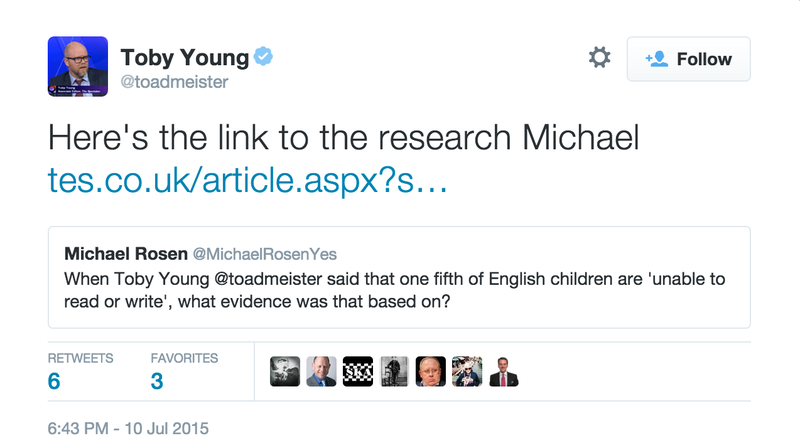 Was he going to cite the TES piece? 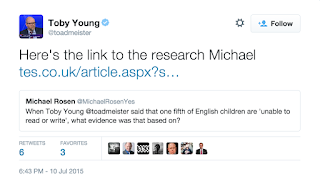 "Will find the link and tweet it"
Tobias(ed) - the missing or the weakest link? Not mutually exclusive I suppose?